You’re in the middle of studying for midterms and all of a sudden, you feel it. The uncomfortable itching at the back of your throat can only indicate one thing: You’re getting sick. You try to stop it by chugging orange juice, Airborne, and Emergen-C, yet nothing helps the inevitable sickness that is about to plague you. Perhaps it was meant to be, but more likely, being stressed, hardly sleeping, and being exposed to thousands of young adults with thousands of germs may have been the culprit. This is exactly what happened to me last week. My days were filled with cough drops, tissues, and NyQuil. Every time I had a spare moment, I would trudge back and forth between Sunshine Market for orange juice and hot tea from Audrey’s Café. In between this torturous running around, I was forced to cram in midterm studying and overwhelming amounts of homework. Yet, there was one thing I craved more than anything else in the world: soup. What better place to serve soup than in Price Center, in the middle of our campus? Now, I understand that one can simply buy soup at the local grocery store on their own, which leads me to the question: When was the last time you had good soup at a grocery store? It’s probably been a long time because soup is best served in a restaurant format. Sure, you can have a decent bowl of soup from the grocery store, and you can always buy microwaveable soups and noodles, but the feeling isn’t the same. Grocery store soups heated up in a dingy microwave fall short of having a warm bowl of soup prepared just for you. You may argue that I could have just walked into a grocery store, purchased ingredients for soup for much cheaper, and made soup for myself. There are a few holes in this theory, such as the fact that no one wants to slave over a giant pot when all you want to do is curl up in bed to sneeze your heart away. Also, soup is one of the most difficult culinary challenges to nail. It seems that moms are the only ones to capture the true art form of a good bowl of chicken noodle soup. Maybe when I’m older and wiser, with a 401(k) and extra time on my hands, I can make my own soups. For now, I am a busy college student that can barely watch one episode on Netflix without falling behind in three classes. There are soups in most dining halls, however, not all UC San Diego students have Dining Dollars. Even for students with Dining Dollars living on campus, the soups offered in dining halls are not always appetizing and only have a small selection to choose from. Everyone has different soup preferences, so why not let the people choose? 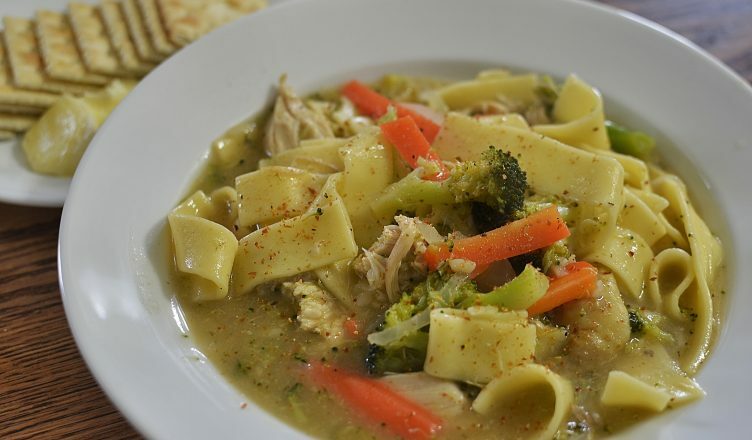 Imagine being sick and having chicken noodle soup, clam chowder, or minestrone all available for you to choose from? It’s the least UCSD can do. There may be times when we crave other foods in addition to soup. Why not also explore cold soups, or even better, salads? Soup and salads are not rare foods to be served together, and there are a whole chain of restaurants serving these foods, including but not limited to Panera Bread and Souplantation. Why not have a soup and salad place in Price Center? It’s the most convenient place on campus, and it gets the most foot traffic, which means a high chance of success for a soup and salad place. UCSD students deserve the possibility of soup. We are overworked and tired and often this leads to weakened immune systems on campus. High stress can contribute to stomach pains and other health discomforts. With our busy schedules, who has time to go to the grocery store in the middle of midterms, much less prepare a large batch of soup for yourself? We should have the option of a hearty meal to help us with sickness pains or growing pains in general. When we’re so far away from our families, we deserve to have a few mini reminders of home, and nothing screams home more than a big bowl of chicken noodle soup on a cold school day. So, this is my proposal. I’ll be waiting with a giant spoon in one hand and my debit card in the other, and I’m sure many other students will be too.